When it comes to planning your wedding, it’s the little details that seem to add up. Your big day shouldn’t be stressful, and choosing something as big as the perfect hairstyle doesn’t have to be hard. 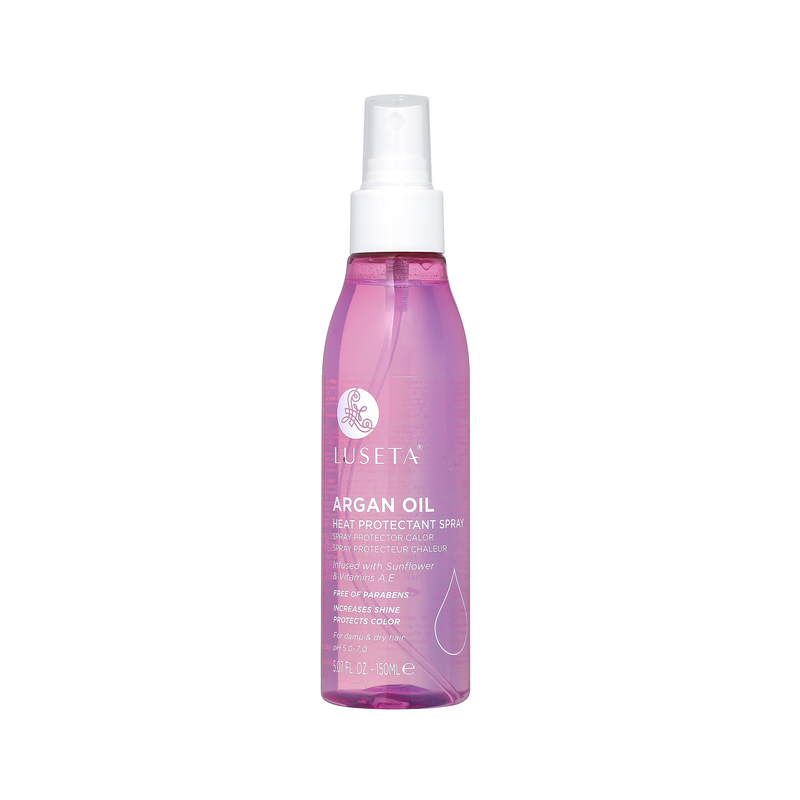 Your hair is, after all, a big part of your life every day. You don’t want to go completely out of your element and try something totally out there if you think it will just be uncomfortable and distracting. Choosing a hairstyle should be as simple as finding a look that you like, that you feel comfortable in, and that you know you’ll look back on with admiration years into the future. That being said, you’ll probably want to also choose something that will compliment the overall atmosphere of the event. With so many wedding hairstyles to choose from, where do you start? We’ve broken down a couple of categories for you to start with that are timeless and beautiful. It’s no secret that braids make for a beautiful wedding look when done right. The style has been popular in some facet for decades now, and there’s no sign of it going away anytime soon. Braids were seen all over runways at fashion weeks around the world this year, and you can expect them to be a big part of the upcoming summer wedding season since the look pairs so well with outdoor settings. Intricately weave embellishments and jewels into braids for an elegant, romantic look. Or, braid some flowers around the crown of your head for a sweet, bohemian vibe at a beachfront wedding event. Since there are so many variations of braids, they can be combined with a loose hairdo or tightly woven up into a sleek top knot for a more chic look. Nothing screams elegance more than a sleek, low chignon bun complemented with just the right amount of accessories. Chignons, like braids, have been staples of wedding hairstyle trends for as long as we can remember—and they’re also not going anywhere. The chignon (pronounced shin-yon) is synonymous with french elegance in that it adds a touch of simple, seemingly effortless glamour. The look can be done up with embellishments or kept simple and paired with a pair of drop earrings. Though the look can be achieved by anyone with hair longer than their shoulders, people with fine hair may want to wear a bun foundation to achieve the thick look that the chignon is known for. On the other end, if your hair is thick you’ll want to pin it down with plenty of bobby pins in order to keep it from falling out. Often just as versatile as having long, straight hair, loc updos are part of major wedding hairstyle trends this wedding season. Whether you twist them into a sleek updo, pull them to the side, or wear them in a romantic half-up style, similar to what Zendaya did for the Oscars in 2015. Twisting your locs into playful bantu knots or braiding smaller locs into low-sitting braids on each side of your head will add a playful touch to an elegant look. 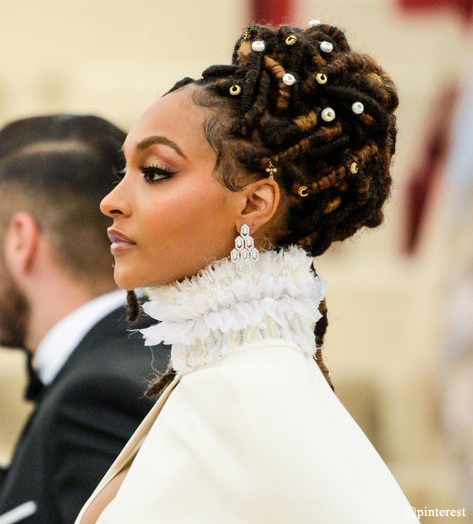 We’re seeing a lot more loc hairstyles on red carpets in recent years, proving that the style is just as much elegant and regal as a shiny blowout. Going for a more bohemian, casual look for your wedding? 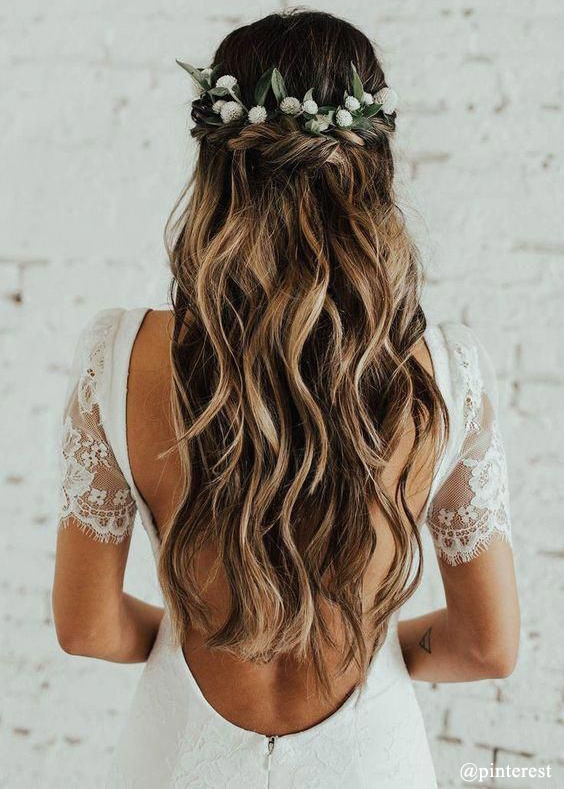 Creating loose curls or beachy waves that sit around your face will add a romantic, yet chic compliment to your wedding look. Styles like these are ideal for summer or outdoor weddings, and can be fairly easy to create on most hair types. Try pinning the top layer of your hair back and adding some flowers or a sparkling embellishment for a casual touch of glamour that will only enhance the look further. These romantic, beachy curls can easily be made with an iron or a set of curlers—it all depends on the specific look you want to achieve. If you’re wearing a tiara or a veil, you can easily create a sleek, glamorous look with a full ponytail or top knot and front pompadour. This look will draw attention to any accessories you wear and pairs well with glamorous wedding looks. 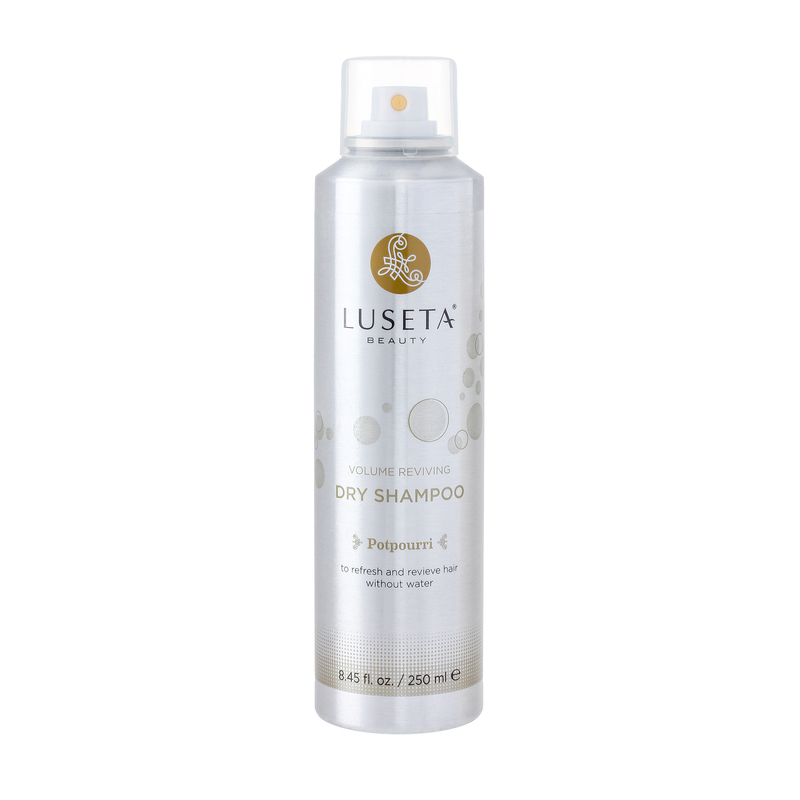 You can easily add volume to an updo by asking your stylist to tease the hair underneath. Pinning up loose curls into a glamorous top knot will create a romantic look to go well under a veil or tiara. Similarly, a chic ponytail or sleek top knot can be easily played up to create a beautiful wedding hairstyle that won’t feel overwhelming to create on your big day.